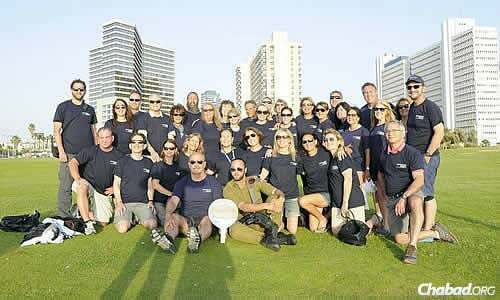 At the closing session in Tel Aviv of an eight-day experience called Mayanot Legacy, where parents of children who have gone on Israel trips get their own taste of the country. A significant percentage of this group hails from Florida. While some summer programs in Israel are on hold during the Gaza conflict, others are going full-speed-ahead, with staff continuing to craft plans and itineraries for the fall, making sure that future experiences match successful ones of the past. The new Legacy program by Mayanot, a Chabad-affiliated organization inJerusalem, for example, is designed to provide adults with an experience similar to those their children experienced on their Israel trips. The eight-day adventure is open to anyone interested in going to Israel, regardless of any previous travels there by the participant or their family members. While it is geared to the parents of young adults who have recently visited Israel for the first time, it’s open to Jewish adults of all ages and backgrounds. The program includes extensive touring in Israel, to places like Safed in the north and the Dead Sea in the south; interactive discussions and a behind-the-scenes look at Israeli politics; a camel ride in the desert and a Jeep tour in the Golan; Shabbat in Jerusalem; and everyday Israeli experiences, like buying snacks at an open-air market. 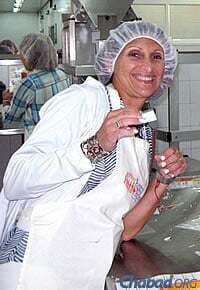 Kosher food is served at tour-sponsored activities, and there is no travel on Shabbat. The groups include a rabbi from back home. Rabbi Pinny Andrusier has led other trips to Israel, but said nothing tops his most recent one with Mayanot Legacy. In June, a group of 15 from his South Florida community took part in the program, which is geared specifically for adults. The Florida group joined 20 other individuals from cities such as New York, Boston and Atlanta. Andrusier, co-director of Chabad Lubavitch of Southwest Broward in Cooper City, Fla., and his wife, Gitty, co-director, served as the group’s spiritual leaders. He went on to explain that they all arrived five days earlier as strangers and now felt connected to one another, to the Jewish people, to Israel, to the place they were standing—where the Beit Hamikdash, the Holy Temple, once stood—and, most importantly, to G‑d. Dancing during a visit to Jerusalem, a significant part of the program for the group of “first-timers” to Israel. 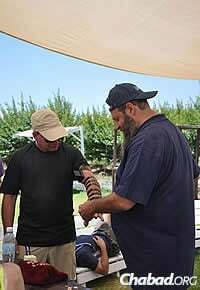 Therefore, he encouraged men to put on tefillin and women to light Shabbat candles. The group also did some volunteer work at Pantry Packers, a food-distribution project of the social-service agency Colel Chabad. “It means taking it upon yourselves to do mitzvahs,” said Andrusier. 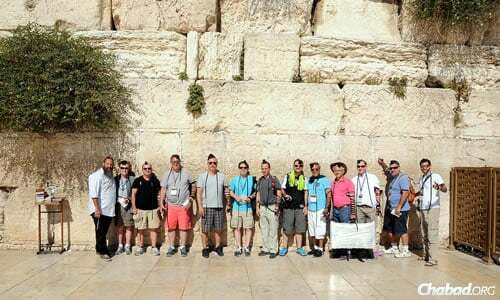 “It was a powerful moment,” he added, and the group was “very active, very into it.” He also led 31 people to an unplanned, middle-of-the-night trip to the Western Wall, the Kotel. That became the group’s slogan on T-shirts and in the messages they later exchanged. They even created a Facebook page, continuing to communicate regularly. On the schedule was some volunteer work, helping box up food for the needy at Colel Chabad’s Pantry Packers. The next trip is scheduled for October, with three more in the works for 2015. “Mayanot Legacy is a way to give parents a taste of what their kids had, exposing another generation to both Israel and their Jewish heritage,” explained Tsiona Mann David of Israel Maven, the tour company that handles the land arrangements during the tour. Mayanot participant Mitch Green and the rabbi cool off at Ein Gedi in the south of Israel. Another participant was Debby Eisinger, who served as former mayor of Cooper City for eight years and before that was a city commissioner. “Connecting with our heritage, engaging in lessons about our history and culture, and seeing the land has opened our minds and hearts to the beauty of Israel,” she said. For more information, go to www.mayanotlegacy.com. 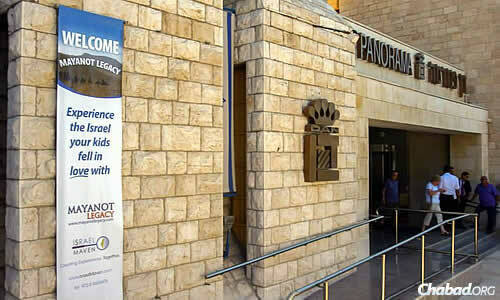 The Dan Panorama Hotel in Jerusalem welcomes the Mayanot Legacy group.